This latest release from the FTD label features a Elvis at probably his worst condition up until this point, as we have already heard recordings from Elvis' last week in Vegas, Elvis was very agitated to say the least, this was mainly down to medication he was taking and around that time he was using his influence to get a little more than he was supposed to, this may help to explain his erratic behaviour, during this time period. I am not suggesting Elvis was doped to the eyeballs, but I'm sure on more than one occasion between the end of August and October, Elvis went too far with his medication. This like I said has became evident on the latter shows in Vegas and continued into following tour, a few of these shows have become widely available on the IMPORT market over the years, the most noticeable being "Desert Storm" from his Closing night in Vegas and the "Profile Box set" that gave us the Collage Park show from September 28th. There have been other shows from this time period but they don't give an insight into Elvis' state of mind quite the same way. Here on "Dragonheart", like the "Profile CD of Collage Park" we get a good example of Elvis trying his best to prove he's at the top of his game, and it doesn't work. As soon as Elvis starts to gets chatty with the fans he's had it, no more evident here than after "See, See Rider", Elvis starts chatting to the audience and gets mixed up with his words talking about flash bulbs, then tells some one in the audience to "Shut up". This then continues after most songs Elvis try's to chat away and make out he's fine? But even the songs on this CD show Elvis' erratic behaviour he's trying too hard a lot of the time and it's not working, his voice is all over the place. Looking back now we all know too well that he wasn't fine, only days before in Collage Park, Tony Brown witnesses Elvis fall out his limo and Elvis looked like he was still asleep just about to go on stage? He wasn't much better on stage either, we all ask now, why wasn't something done then old Mr. Brown must have thought to himself what the hell's going on here, what have I joined?. Back then the press told of Elvis' paunch and the roomer of drugs in Vegas, and a little about his behaviour on stage, but nothing that couldn't be washed under the carpet, as far as Elvis was concerted anyway. But today we are all too aware of what life was like for Elvis around this time. The shows released on CD's like "Breathing Out Fire" have Elvis come on stage sing the songs, he's supposed to do, then introduce the band and that's about as much talking as he does on stage, throughout the shows, and leaves, these don't sound too bad in some cases he puts on some outstanding performances. Personally I think Elvis read a few of the reviews that talked about his problems, and these pissed Elvis off, and it was times like this he went on stage and tried to prove them wrong and what we hear on this CD from FTD and the others is proof of it. Which is a shame, as again it all comes back to who could have helped him, we now know Elvis couldn't help himself, and the people around him couldn't either, whether they wanted to or not. And we can but thank FTD for helping show Elvis for what he was, just a man. It has been a while since we have had a CD from the 2001 label, and when they put one out and into our hands they never seem to let us the fans down. 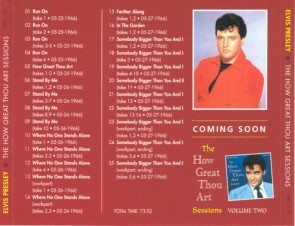 This is the first of a series of CD's that will feature the recordings from May 25th - 28th 1966 at Nashville's Studio. B. Most famous for the "How Great Thou Art" album, hence the title. 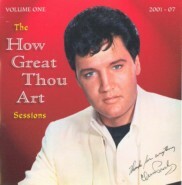 "How Great Thou Art", the song that would eventually become the albums title cut, is inspired by a Sons of the Pioneers record although Elvis relies on a more recent interpretation by the Statesmen. Friend Jerry Schilling saw Elvis recording this track and noted while the singer did just a few takes he was totally "drained" by the songs completion. Shilling believes Elvis touched something "outside the normal experience". This track starts with Felton stating this is "How Great Thou Art take 1" followed by a little chat and a count in, Felton stops this just as Elvis starts and asks for another take. This you can hear Elvis sing his heart out, and is probably the first time Elvis puts so much into a song, later he would excel himself even further with "Where No One stands Alone" this track has to be one of the highlights of this album. With so much expected form the ending of the song, the only way Elvis could do the song justice was to do a workpart for the ending. As we start to hear from this session a slightly more powerful voice from Elvis, Felton after take 3 of "Where No One Stands Alone" states "God you scared me half to death" this was purely because of the sheer power Elvis put through the microphone. It's possibly at this session Elvis found he could do a lot more with his voice if he cared to put it to the test, and his voice hadn't been tested for a few years, the last time would have been in the early 60's with "It's Now Or Never and the likes of "Surrender" but no real test to his voice since especially with the movie songs he had to record. 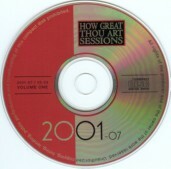 The CD has a fair amount of between take chat, and harmonising by everyone, and this is a pure and utter joy to hear these sessions as close as we can to the way they were originally recorded, and how each track was built to what we would eventually hear in the form of the original album "How Great Thou Art" although no masters takes are on the CD it's not a great loss as we have them anyway in the end form on the fore mentioned LP/CD and if they were on this release they would have had to drop around 15 minutes of the out-takes, and I know which I would rather have. The back cover of the CD has a nice colour shot of the next instalment "Volume Two" and hopefully it won't be too long before that disc can grace my CD shelf. The only down side I found on this CD, like many we get from the bootleggers, is the sound! Although this CD is only in mono you still get a great sound blasting out your hi-fi, but if you listen through earphones you can pick up a lot more, and unlike the official releases this is not always a good thing, as on this CD you can hear a slight tinny/bleed/annoying noise how ever you want to describe it. Therefore to get the best result from this CD is not to listen with any earphones, as you will find it hard to pick up this little distortion if you leave them off. This is not a fault of the label, it's a fault on the tapes they have to work with, and until they get full access to BMG vaults it's just something we'll have to put up with, so stick it in your Hi-Fi and enjoy a CD that is sure to become a classic. It's still great sound and a great session��. On the front cover it states "A Previously UNRELEASED Audience Recording" well no quite this has been doing the rounds for a long time on the old CD-R market, then more recently on the TeenAger label CD under the title "Burning Vegas Down" although here on the memory label the sound is a little better, also seven bonus tracks added again all previously available on other CD's over the years, but once again the quality has been touched up slightly. 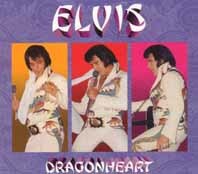 The most noticeable thing about this show is the couple of lines Elvis did of "The Lords Prayer". Elvis is in good fettle, and is an above average performance, just a shame not in perfect quality? Unlike the above this does not state this is Unreleased, funny enough it again had done it's rounds on the CD-R circuit before the TeenAger Label committed it to CD under the title "Another Night In Tahoe". Again slightly better sound but this memory version seems a little muffeled compared to the TeenAger version, but once again Memory have added another seven bonus tracks just for good measure. Nothing about this show really stands out and hits you, but still a fine show.. But most noticeable about these two CD's is they are the worst sounding of all the Memory CD's todate?